In the past few months you may have noticed the little button in the sidebar with a pair of feet running alongside some adorable penguins. Maybe you have even clicked on it once or twice. If not, please allow me to introduce you to my brother in law, Dean Schuster. Dean is an ultra-marathoner, a lover of penguins and an all around crazy person. You see, Dean is about to embark on a trip half way around the world to run the 2012 Antarctica Marathon to promote fitness and raise money for penguin conservation. You heard me. Dean will be running 26.2 miles in ANTARCTICA. And if that wasn’t spectacular enough, he has already raised over $25,000 for penguin conservation! 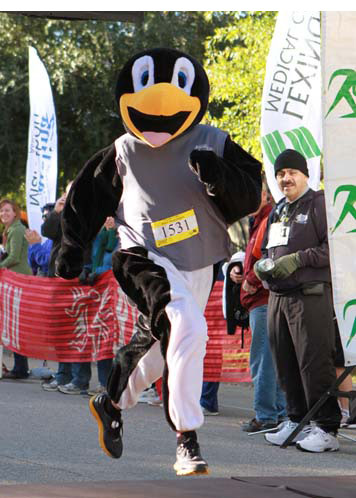 The Antarctica Marathon supports Oceanites, an organization devoted to the science of penguin conservation. Race organizers have given me passage to Antarctica in exchange for fundraising for this non-profit. I am a conservation-minded person who loves the science of everyday things. This was a perfect match. Honestly, I have learned almost everything I know about penguins from my experiences with this project. Some species are in real trouble. The Humboldts of Peru are declining rapidly. We’ve raised some money for a project there. In Antarctica, the Emperors need help. On the Peninsula, Adélies and ChinStraps are not fairing well in the rapidly warming climate. No. There are no Polar Bears South of the Equator and no Penguins North of the Equator. What does one wear to jog in Antarctic temps? I will wear lots and lots of layers that can be removed if necessary. It’s summer in Antarctica, so we’re expecting balmy temperatures in the low 20s with high winds that take about 10 degrees from that. Not too bad. I’ll focus on keeping my extremities warm. I’m very serious about this. In fact, the fine folks at Thermajock have given me a sample of their product for just this purpose. It warms exactly what you’re thinking it warms. Why is this good for our kids (or future kids)? We humans have a responsibility to understand the world we live in, and to protect and conserve it. When we do this, we set an example of lasting value to our children. Antarctica is a fascinating and fragile place. We can learn a great deal about the rest of the world by studying it closely. How do you run on the ice? I’ll actually be running on dirt. It may be snow covered, but near the shore, Antarctica is kind of like the surface of Mars, just not red. Inland, the ice can be over two miles thick. My flight to Buenos Aires from Charlotte will take about eighteen hours (with a small layover in Miami). Then I’ll fly to Tierra del Fuego, which will take another half day. From there, I’ll board a research vessel that will take two or two-and-a-half days to get to Antarctica. From there, we’ll sail further South down the peninsula. What is the thing you are looking forward to most during this trip? Is it true that you plan on sleeping in a tent on the ship? On the ship, I’ll be in a triple-bunk room. I will, however, be sleeping in a tent on the Antarctic Continent on one night, and doing some Kayaking in the Southern Ocean. I’ll also do something called the “Penguin Plunge”. I’m told this will be exceedingly cold. If I am lucky, I will see many species of whale, including Killer Whales (Orca) and possibly even Blue whales, the largest animal on the planet. Ok y’all, if that doesn’t inspire you, I don’t know what will! Oscar loves learning about the penguins and I think this experience is a great teachable moment for kids of all ages. The Antarctica Marathon is on March 9, 2012, but it will take days for Dean to travel from South Carolina to Antarctica. 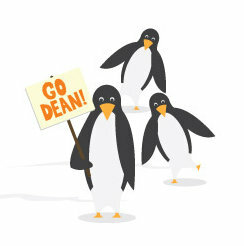 Follow Dean’s adventure on Running With Penguins and help him reach his fundraising goal of $30,000 for penguin conservation! We’re gearing up for silly 5Ks over here… we’ll think of YOU! Dean rocks. What a great cause and a fun guy. Good luck from North Carolina! This is awesome! Can’t wait to share with my animal loving kiddies! AMAZING!!! Good luck Dean, and thank you for being such an inspiration! Thanks for the post, Andrea!!!!! !